Long term release - This version is recommended for most users. Development release - This version is for testing. Could be unstable. For a more detailed description including how to install QGIS on a Windows PC (see below) or watch this instruction video. You can find more introductory videos on how to use UMEP on our YouTube-channel. Since QGIS is a multi-platform software system it works on other platforms as well. UMEP is constanlty under development so there may be missing documentation and instability. Please report any issues to the code repository. Also, have a look in FAQ for further installation tips and issues. UMEP-version for QGIS2 is decrapted since february 2019 since the new long-term release verion of QGIS is 3.x. Visit QGIS and go to the download page. Preferably, choose the OSGEO4W Network Installer (64-bit), start the installation and choose installation (64-bit) For Advanced Users. To install the latest version (3.x), start the installation and choose Express Desktop Install. To install the LTR, start the installation and choose Advanced Install. Click through to Select Packages and select qgis-ltr-full. Visit www.qgis.org for installation on other operating systems. Click Install Plugin (or Upgrade if already have an older version installed from before). Extract the downloaded zip archive into the folder C:\Users\.qgis2\python\plugins. If the folder plugins does not exist, install any plugin using Plugins -> Manage and Install Plugins and the folder should appear. Start QGIS. The UMEP plugin should be visible in the QGIS toolbar. If not, go to “Plugins -> Manage and Install Plugins -> All” and search for UMEP. Make sure that you also tick in the box Show also experimental plugins in the “Settings”-tab. Test datasets and tutorials are available to try some of the tools out. Some of the plugins in the UMEP tool, for example The WATCH data plugin, requires some Python libraries such as scipy and pandas that might not been included when you installed QGIS. If so, it is necessary to install them to make this plugin work. Below are instructions on how to this for different operation systems. The same procedures can also be used to obtain other tools and functionalities from the OSGeo repository. Linux comes with its own Python installation which QGIS makes use of. This makes it possible to directly use pip (an installation tool of Python libraries) to add missing libraries. Simply open a terminal window and type sudo pip install pandas if you want to install this library. In order to install pip open a terminal and type: sudo easy_install pip. You might need to restart QGIS to get it to work. 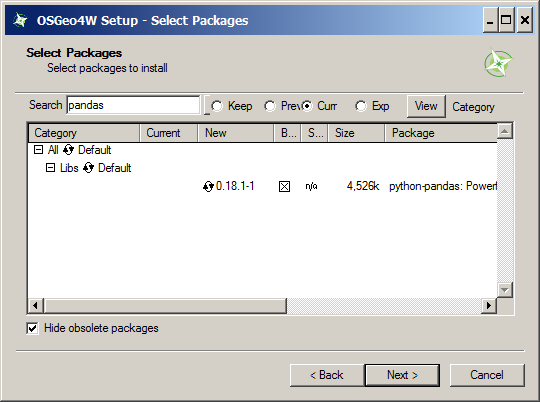 As Windows has no Python installation included, QGIS make use of a separate Python installation added when QGIS was installed on your PC. There are two options available. (Try this first) Installation of e.g. pandas Restart the installation (64-bit) For Advanced Users (see Getting started) and choose Advanced Install. When you come up to Select Packages search for pandas and click on Skip until you see a version number of pandas (see left picture). Finish the installation. pip is a command to install python packages but pip cannot be used directly from a common command line window (cmd.exe). However, if you installed QGIS according to the recommendations in Getting started you should have a OSGeo4W shell installed where you can use pip to add desired Python libraries. OSGeo4W shell is found in the Windows start menu. To use it with QGIS3, type py3_env the first thing you do after you have open OSGeo4W shell. Follow the instructions for Linux. *Note*: this approach is tested to be working under Mac OS X 10.11.5.